Welcome to the four hundred and sixty-second of my blog interviews with novelists, poets, short story authors, biographers, agents, publishers and more. Today’s is with autobiographer Julius Babyetsiza. A list of interviewees (blogged and scheduled) can be found here. If you like what you read, please do go and investigate further. Morgen: Hello, Julius. Please tell us something about yourself, where you’re based, and how you came to be a writer. Julius: I am Julius Babyetsiza. I am a Ugandan by nationality, living and working in Kampala. “Destined to Triumph” – my published book by CreateSpace, Amazon’s own publishing house, is my first shot at writing a book. The only writing experiences I had had are nine exciting newspaper articles that I wrote in the Uganda’s state owned leading daily, the New Vision, during the period between August 2009 and February 2010. The articles were classified as politically sensitive and I was demanded to stop writing them. The dismay to continue writing the articles in the New Vision is one of the things that inspired me to write “Destined to Triumph”. I pinpointed this out in the book’s prologue. Morgen: I’m so not a fan of red tape and it’s a such a shame that we can’t say what we like but I guess there has to be a line in most cases. What genre do you generally write and have you considered other genres? Julius: Biography – Autobiography. I am considering venturing into inspirational and educational genres. Morgen: They’re very popular. Please tell us more about your book. Julius: “Destined to Triumph” is a wisdom cache of tough life experiences of an African child, Julius Babyetsiza, who has seen it all. In this deeply-moving autobiography, I give a presentation of highly engaging snapshots into the turbulent life twists and turns that I have waded through as an African Child. Morgen: It’s a well-known fact that fiction has to be gripping but it’s the same, isn’t it, for non-fiction too or they won’t be page turners. Have you had any rejections? If so, how do you deal with them? Julius: Yes. It is understandable given that rejections constitute around 97% of all the submissions that traditional publishers receive. Morgen: At least that, I’d say, yes. Do you have an agent? Do you think they’re vital to an author’s success? Julius: No. I am an independent author. Yes, if the book has the mantle, I think having an agent would greatly improve the chances of the book to be a bestseller. Morgen: I’m sure you’re right. You’ve used Createspace to publish your book, is it available as an eBook? Were you involved in that process at all? Do you read eBooks or is it paper all the way? Julius: Yes, on Amazon. And yes, I was involved in the process of their making. Yes, I do read e-Books. Julius: I think I have done a fairly good deal of marketing my book and my other writing works as well as myself. This is essentially using and through social networking websites, including Facebook, LinkedIn, Yahoo and Google as well as within the enclaves that I mingle into. Morgen: It seems to be the way to go nowadays, doesn’t it. What do you like to read? Julius: My favourite writer is China Achebe. Forest Whitaker is my favourite actor – his performance as Ugandan dictator Idi Amin in ‘The Last King of Scotland’ was an enchanting. Morgen: It was brilliant (and the first time I really noticed James McAvoy, I think). Presumably you had full say in the title and cover of your book, how important do you think they are? Julius: Yes, I chose my book’s title and covers. I take this to be very important. Julius: Marketing “Destined to Triumph”. I have also started on my next book, tentatively titled “People’s Beatitudes” as in Jesus’ Beatitudes. Julius: No, I find it difficult to write every day. Yes, and I think that it is not unseriousness to suffer from a writer’s block. Morgen: I’m sure even those who say they don’t (myself included) get stumped within individual projects and either have to do something completely different or move on to another project so we see the original one with fresh eyes. Do you plan your books or do you just get an idea and run with it? Julius: I have just [virtually, since 2010] ventured into writing and, I think I need to take a training in the same, but in the meantime, I just get an idea and run with it. Morgen: It is a craft that needs to be learned (like painting and playing the piano) but practice plays a major part and at least you’re writing. Do you write any poetry? Julius: No. Not yet, may be in the future. Morgen: I dabble, but to write a genre or format you have to have an interest in the medium and read it and (sorry any poets reading this), I don’t. I do have two poets in my writing group who write little else and love it. Wouldn’t life be dull if we all liked the same things? Do you do a lot of editing or do you find that as time goes on your writing is more fully-formed? Julius: Yes, I do a lot of editing, which I think depicts writing amateurism and, therefore, I need to grow. Morgen: All writers, I think without exception, would look back at their early work and either cringe (I know I have) or see where they would make changes, like anything we do, we become more practiced and confident. I’d say for anyone starting out, it’s better that they do plenty of editing as it means they want it to be as good as it can be but also that they can already see where they are going ‘wrong’ is a great thing. Do you have to do much research? Julius: Oh sure. One needs to do a lot of research; else he/she would discover what is already discovered. Morgen: That’s true. What point of view do you find most to your liking: first person or third person? Have you ever tried second person? Julius: First person. If I have tried second person, then still it is rare. Morgen: It is, and certainly an acquired taste. I love it but many people don’t (and really don’t!). Do you have pieces of work that you think will never see light of day? Morgen: Excellent. 🙂 Let’s hope that continues. What’s your favourite / least favourite aspect of your writing life? Julius: So far my early life account is my favourite aspect of my writing life. Julius: In the field of writers, it is as tough as in the field of upcoming musicians, but the tough can get going. Morgen: Absolutely. A successful writer is one who didn’t give up. If you could invite three people from any era to dinner, who would you choose and what would you cook (or hide the takeaway containers)? Julius: The Bible’s books writers, Chinua Achebe and Adam J. Jackson. I would cook for them dishes from Ugandan / African garden because theirs are not genetically modified crops and, while I am with them on the table, I would share with them Hosea 4:6, “My people are destroyed from lack of knowledge …” – which is what is killing Africa. Julius: Yes, I love quoting Bible scriptures. Julius: I am strategising to do a doctoral research degree [PhD] on a topic, where I would have written my second book – The Critical Analysis Of The Impacts Of Higher Education In Uganda In Localising Employment Creation In Rural Communities And Transforming The Country’s Rural Economy. Julius: I do reading if I am not doing other work. Internet, reading, watching TV and jogging are my hobbies. Morgen: Reading is so important to a writer, a form of research at, for me anyway, it’s most enjoyable. Are there any writing-related websites and/or books that you find useful? Julius: Yes – HarperCollins’s facility for writers, http://authonomy.com has inspired me a lot. Morgen: Is it a great site. I was on it for a while but didn’t have time to do all the critiquing (unfortunately). Are you on any forums or networking sites? If so, how valuable do you find them? Julius: Yes, including Facebook, LinkedIn and Twitter. I am on forums of LinkedIn Authors, Writers, Publishers, Editors, & Writing Professionals. They are great marketing channels for one’s works as well as one’s self as a brand. They can offer solutions to one’s challenges, issues and problems. Morgen: They are great. There always seems to be someone who can help. What do you think the future holds for a writer? Julius: Since e-books trends are growing faster, I think the future writer needs to watch keenly the e-books’ space. Morgen: They do… I am. 🙂 Where can we find out about you and your work? Julius: It is natural for a mother to think that her daughter is gorgeous. However, “Destined to Triumph” is a truly exciting book. The Monitor [the most popular non-state newspaper in Uganda] in its 17/12/2011 press review release of “Destine to Triumph” commended the book saying, “The book is written passionately; with the author going beyond his personal life to expose the ills crippling the land. It is a commendable attempt at opening the eyes of the people of Uganda to quit goofing and rise above the mediocrity and build knowledge and technology-driven economies to overcome graduate unemployment, poverty and backwardness”. However, Ugandans only stopped at reading about “Destined to Triumph” in the 17/12/2011 Saturday Monitor newspaper press review release. Up to now I have failed to avail copies of the book in Uganda’s local book outlets! I have been facing financial difficulties since March 2010, when I resigned or rather was discontinued from a job that I was doing at that time as can be read in the Prologue of “Destined to Triumph”. Nonetheless, being laid off is what inspired me to write “Destined to Triumph”, after being faced with conditions to stop writing what they classified as politically sensitive newspaper commentaries. Morgen: Motivation is a wonderful thing. Is there anything you’d like to ask me? Julius: Do you know the most inexpensive books shippers that I can use to ship “Destined to Triumph” to Uganda from US’s CreateSpace? Morgen: I don’t unfortunately, my books are only eBooks and I’m based in the UK (where postage is pretty expensive). Perhaps someone reading this can help? Or perhaps you could start a LinkedIn thread? Thank you, Julius. ‘The poor you will always have with you, and you can help them any time you want.’ Mark 14:7, NIV. However, the time has been long overdue. With reeds seen growing naturally everywhere in Toro, which is proof for high soil fertility, there is a level below which the local people should not be living. In Ankole such fertile soils are found in Kigarama Sub-county, Sheema District. Batoro leaders need to visit Kigarama and see, listen and learn from success stories there. 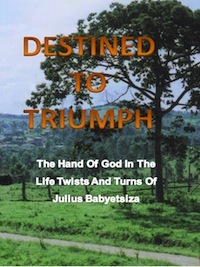 “Destined To Triumph” is a wisdom cache of tough life experiences of an African child, Julius Babyersiza, who has seen it all. In this deeply-moving autobiography, Babyetsiza gives us highly engaging snapshots into the turbulent life twists and turns he has waded through, which leave us convinced about his belief that he can only be surviving through the omnipotent protection of the “Hand of God”. “Destined To Triumph” poses a universal question as what is the return on investment in education in Uganda / Africa given that the continent has remained crawling technologically when the rest of the world is running. He sounds an oracle to Uganda’s political and university leaders to build knowledge-driven national economy; else “History catches them on the wrong side”. Woe, however, “The falcon cannot hear the falconer. One of the hallmarks of “Destined To Triumph” is the suggested new leadership paradigm shift that will enthrone universities / university leaders as the guardians of political and socio-economic accountability. JULIUS Babyetsiza is a Ugandan. Having lost his father who had already divorced his mother at a very young age, Babyetsiza owes his survival and ability to continue his education to his elder brother, Francis Tamwine, who sacrifices his own primary education to assume parental responsibility and fend for his two younger brothers and two sisters. From then on, Babyetsiza had to settle for a life of uncertainty, tilling the land to supplement the support from his brother, relatives and friends for his education, which leave us convinced about his belief that he can only be surviving through the omnipotent protection of the ‘Hand of God’. 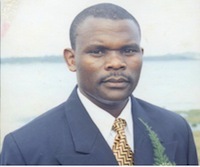 After his A’ Level, he won a scholarship through the Government of Uganda’s Ministry of Education, to study in the former USSR’s Ukraine at Odessa Institute of National Economy and Odessa State Economic University where he obtained a degree of Bachelor of Science in Economics with Statistics (1993) and degree of Master of Science in Economics with Statistics (1996) respectively. As well as featuring satisfied books lovers, the likes of Richard Davison who intimates, on September 30, 2012 thus: Richard Davison Received your book in the mail from CreateSpace.com and find it very interesting and good. Destined to Triumph, The Hand of God in The Life Twists and Turns of Julius Babyetsiza is an excellent book to have. I hope your many friends and others will be purchasing it like I did. It comes in the mail quickly! 5a.m. Flash 150812 – I’m a guest writer on Tom Rizzo’s blog! Dear Morgen, thanks for exhibiting real patriotism to fellow writers. May God repay you several folds.